This artefact was reported through the Fishing Protocol by Sussex Inshore Fisheries Conservation Authority. Wessex Archaeology’s find’s expert Lorraine Mepham identified it as a seal-top spoon. 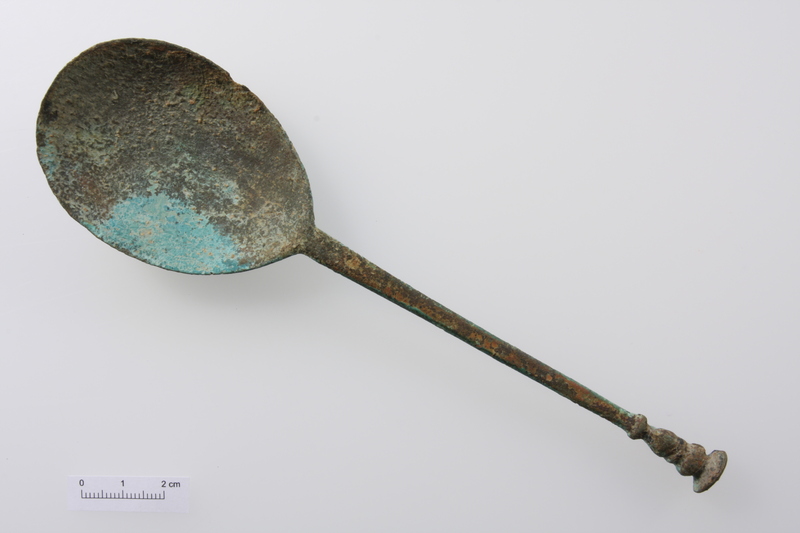 The spoon is made of a copper alloy, which is evident from the green/blue discolouration of the metal. The spoon has a fig-shaped bowl with little or no reinforcement of the bowl underside. At the top of the handle there is a seal-top knop surmounting baluster moulding. A seal top spoon refers to the shape of the spoon, which ends abruptly as if cut off, leaving it flat. The seal-top was introduced during the reign of Elizabeth I, but the baluster mouldings are later variants, belonging to the early 17th century (James I or Charles I). During the 16th and 17th century it became common when travelling for people to carry their own personal eating utensils and writing materials. Most letters and documents were sealed with wax and it was for this purpose that spoons were often manufactured with the owner’s seal on the end of the handle. On close examination of this spoon it is impossible to tell if there was a seal on the top for this use. This may because there was not one, but it could also be due to corrosion when the artefact was in the sea. This find was discovered on intertidal mud in the Chichester Harbour area, washed up by the sea. It may have been moved by currents from a shipwreck site or it could be an isolated find thrown overboard as refuse. location and all finds reported can add to our knowledge of the past in the local area. Remember you can report any discoveries made while fishing in the Sussex area, phone, post or through our online form. Wessex Archaeology were invited by the Sussex Inshore Fisheries and Conservation Authority (Sussex IFCA) to attend a Ministerial meeting in Shoreham and present the newly launched Fishing Industry Protocol for Archaeological Discoveries (FIPAD). 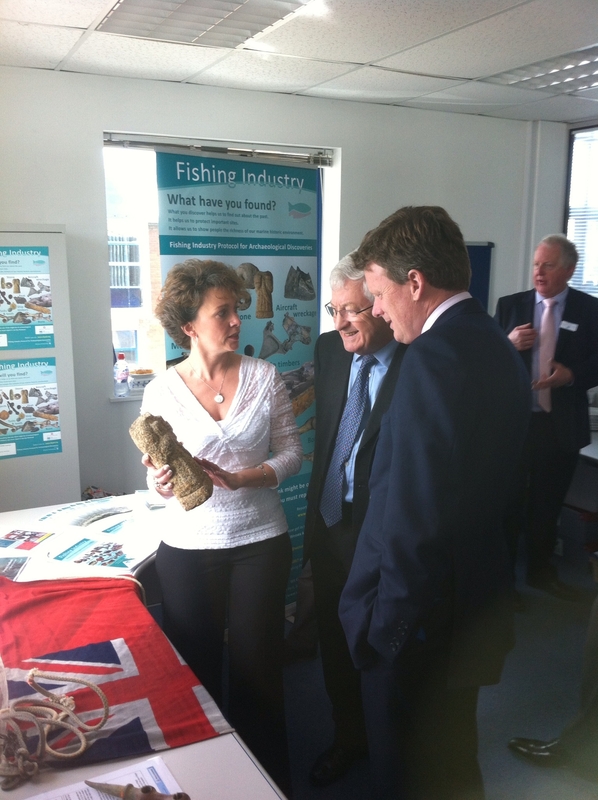 On Monday 30th April 2012 the Rt Hon Richard Benyon MP, Minister for Fisheries, officially opened the new Sussex IFCA offices and drew attention to the new Protocol. Following a briefing about the Protocol by Dr Nikki Cook of Wessex Archaeology, the Minister was keen that the FIPAD project should be operating throughout other IFCA areas, which was very encouraging. Mr Benyon heard about the importance of the objects reported so far and saw the display and promotional materials that Wessex Archaeology has prepared. The meeting coincided with the AGM of the Sussex IFCA, and there was the opportunity to promote the FIPAD project amongst its members, including representatives from the Marine Management Organisation (MMO), sea-anglers, fishermen and local councillors. The enthusiastic support and interest in the newly launched Fishing Protocol will hopefully result in some exciting archaeological discoveries being reported in the coming months. Sussex fishermen can now report archaeological finds through the Fishing Industry Protocol for Archaeological Discoveries (FIPAD) online form. On April 1st 2012, Wessex Archaeology launched the FIPAD on behalf of English Heritage. Working in collaboration with the Sussex Inshore Fisheries Conservation Authority (Sussex IFCA) the Protocol is a pilot project to help fishermen report any archaeological finds they come across during their work. The aim is that the protocol will eventually run nationally. The UK’s fishing fleets are responsible for some of the most important archaeological discoveries of the past 40 years, with anything from Palaeolithic flints to modern shipwrecks snagged or dredged up in fishing gear. Reporting your find directly to a FIPAD Contact at your land port. Click here for a list of FIPAD Contacts. The FIPAD website (www.fipad.org) also offers downloadable resources, which provide information on identifying archaeological finds, how to report them and what to do with a find after its discovery. Click here to visit our resource page. 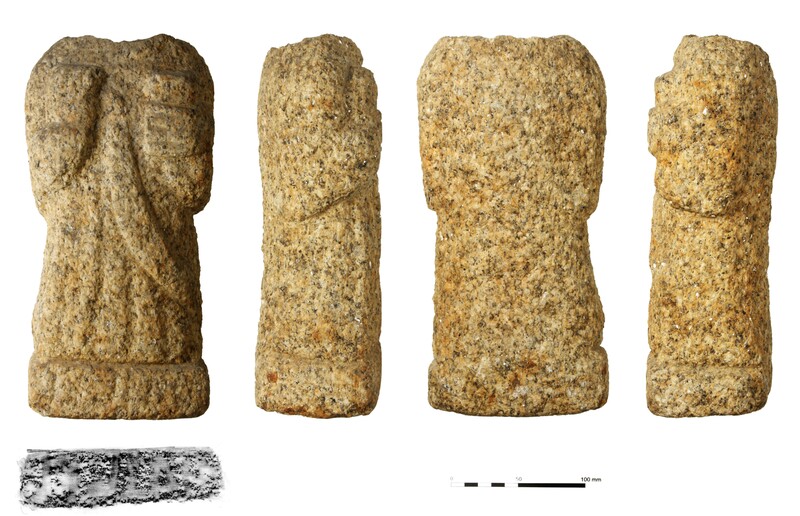 This stone statue, possibly medieval in date, was reported during the preliminary development of the project. A lobster fisherman discovered it in Chichester Harbour. The statue will soon be laser-scanned by a team at Bournemouth University, which may help date and identify the piece, as there are the faint traces of lettering across the bottom of the figurine. The Fishing Protocol Team are at hand to deal with any reports and will make sure new discoveries are highlighted on the FIPAD website. If you have questions or queries contact the team by email or phone. The new Fishing Industry Protocol for Archaeological Discoveries (FIPAD) website has just been launched. Keep visiting the website for more news over the coming weeks. Nets, Wrecks & Artefacts-Public Talk.